We are reporting “Live” from Gunther’s Gourmet Gala 2012 in Richmond, Virginia. And while this is our first time at Gunther’s Gourmet, we will be seeing some old friends as well as meeting new ones. 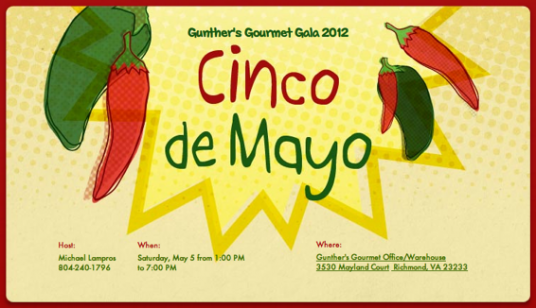 A customer appreciation day / Cinco de Mayo celebration at Gunther’s Gourmet office & warehouse. This is a great opportunity to get out, enjoy the day and meet some of the regions best food manufactures. Each vendor will be showcasing their products and offering them for Wholesale & Retail sale. Peanut Butter/Granola: Puck’s Gourmet Co.
We’re looking forward to a fun day at Gunther’s Gourmet. And in the end, maybe you’ll see a sauce you want to buy and try, and that makes you and us and everybody happy! Also a big thank you goes out to all the Vendors that showed up to the Gala. Without them and all their hard work – the Gala is just me drinking by myself and pushing Gunther’s products to no one. It takes everyone to make this a good time and I think we all had a good time. It means so much to me that everyone in this community pulls together to make these type of events possible. Mike, you put on a good “show”. We had a blast, and indeed have a review or two or three up our sleeve from the sauces you provided at the show. Hi Brian! It’s Lauren from The Schobergs! It was great to meet you and Marilyn at our first ever industry event! Mike and everyone else involved with Gunther’s Gourmet Gala were such fantastic hosts! Thank you for sharing your time and knowledge with us! We are so lucky to have met Buddah and to have been introduced to ILoveItSpicy.com, he is a great guy that has given us the opportunity to meet other great folks like the Gunther’s crew and you guys from HotSauceDaily! Hope to run into you all again soon and thank you gain for the warm welcome! Hi Lauren! You and your hubby certainly brought an energetic and insightful preview of all the products. What a pleasure it was to meet you both! We look forward to meeting you both again soon!